This exclusive Signet Classic edition contains 203 of Aesop's most enduring and popular fables, translated into readable, modern American English and beautifully illustrated with classic woodcuts by the great French artist J. J. Grandville. It is both amazing and wonderful that so much of the richness of our language and our moral education still owes a huge debt to a Greek slave who was executed more than two thousand years ago. 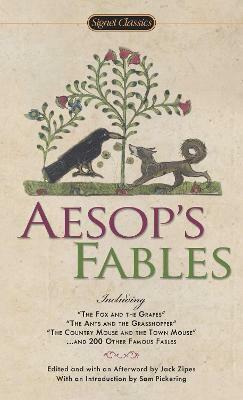 Yet "sour grapes," "crying 'wolf, '" "actions speak louder than words," "honesty is the best policy," and literally hundreds of other metaphors, axioms, and ideas that are now woven into the very fabric of Western culture all came from Aesop's Fables. An extraordinary storyteller who used cunning foxes, surly dogs, clever mice, fearsome lions, and foolish humans to describe the reality of a harsh world, Aesop created narratives that are appealing, funny, politically astute, and profoundly true. And Aesop's truth--often summed up in the pithy "moral of the story"--retains an awesome power to affect us, reaching us through both our intellects and our hearts. Including: "The Fox and the Grapes"
"The Ants and the Grasshopper"
Aesop, according to various sources, was born in Phrygia, Lydia, Thrace, or Sardis, and lived from about 620 to 560 B.C. Little is known about his life, but Aristotle mentioned his acting as a public defender, and Plutarch numbered him as one of the "Seven Wise Men." It is generally believed he was a slave, freed by his master because of his wit and wisdom. As Aesop became famous for his fables, which used animals as a code to tell the truth about political injustice, he incurred the wrath of the rulers, either in Athens or Delphi, and was executed. In about 300 B.C., Demetrius Phalereus of Athens made the first known collection of Aesop's fables, which then spread far beyond the Greek world. Jack Zipes is a professor of German at the University of Minnesota. He is the author of several books of fairy tales, including Breaking the Magic Spell and Don't Bet on the Prince. He is also the editor of several volumes of fairy tales, including Beauties, Beasts and Enchantment: Classic French Fairy Tales, The Fairy Tales of Oscar Wilde, The Fairy Tales of Frank Stockton, and Arabian Nights. Sam Pickering teaches English at the University of Connecticut. He has written more than two dozen books, including Waltzing the Magpies, an account of a year he and his family spent in Western Australia, and Dreamtime.